View the entire table of contents for the June 30, 2015 issue. Disaster loomed in Burgundy's 1993 vintage. To save their grape crops, growers had to spray twice as much fungicide as in a normal year. Marcelle ("Lalou") Bize-Leroy would have none of that. As a result of her unusual business model, the Leroy cellars in Auxey-Duresses may house the greatest collection of mature Burgundy anywhere. Wine Spectator's Bruce Sanderson explains. 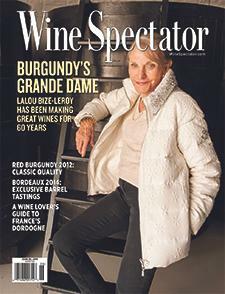 For the full article, check out the new issue of Wine Spectator, on newsstands June 2, 2015.